When it comes to the reduction of lower back pain, improvement of posture, and maintenance of health, strengthening your core is important. While many people long for a trim and slim core, most don’t know the most effective way to achieve this. Although sit-ups and crunches work abdominal muscles differently, these two exercises are at times used interchangeably. However, noticeable differences between the two exist, especially with sit ups generally involving a larger movement than crunches. To help you understand each exercise better, below are their differences, the muscle groups each works on, how to exercise each correctly, their variations, and the reasons why one might be better than the other. 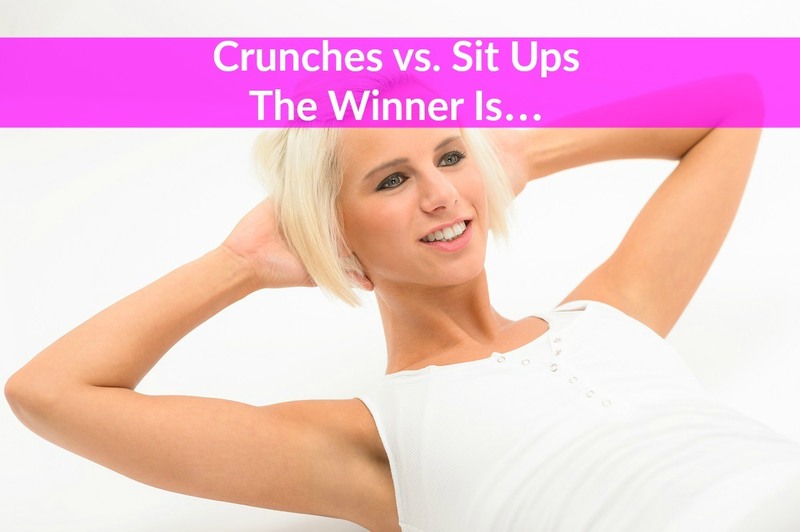 What’s the Difference Between Crunches and Sit-ups? However, sit-ups and crunches are two different types of workouts, each targeting different muscle groups. Since they do not have the same functions, including both in a core body workout is recommended. To provide a better understanding, let us look at each exercise individually. Also known as curl-ups, sit-ups are abdominal endurance training exercises, typically performed to strengthen and tone abdominal muscles. (2) A sit-up is similar to a crunch albeit with a fuller range of motion. As a multi-muscle strength training exercise, sit-ups work or condition more muscles than crunches, which is one of their advantages. Sit-ups don’t target stomach fat specifically. Sit-ups will, therefore, ensure you end up burning more calories by helping you to build muscle. In addition, strong core muscles can improve posture and enhance appearance without loss of weight. When it comes to sit-ups, the main drawback is the possibility of a neck and lower back injuries. If you previously had any related injury, you should seek the advice of a doctor to minimize the probability of a strain. For beginners, aiming for ten repetitions at a time is recommended. » Just like you would do for a crunch, start by laying down flat on your back. Although you can always hook your feet under a secured object for additional stability, it uses hip and leg muscles, which will put less stress on your abs. » Rest your hands lying at your sides, crossed on your chest or behind your head. You can alternatively position your hands such that your fingertips are touching your ears. To minimize the involvement of your back, flex your neck slightly with your head tucked forward. » Raise both your shoulder blades and head from the ground and exhale as you rise. Concentrate on utilizing your abdominal strength to lift your upper body off the ground until you are upright or in a semi-seated position. » Lower yourself back to the ground and return to your starting position, inhaling as you lower. Although sit-ups are arguably the best when it comes to building core muscles, a variation might make this exercise a little bit more exciting and rewarding, especially since sit-up variations are typically more challenging than the traditional workout. Although crunches can help you build muscle just like sit-ups, they are not like sit-ups since they only work your abdominal muscles. For those trying to achieve six-pack abs, this extreme muscle isolation is a significant advantage, one that has turned the crunch into a popular exercise. Despite working the abdominal muscles only, their intense muscle isolation makes crunches ideal for strengthening the core, which includes your lower back muscles and obliques, and this is known to improve both balance and posture. As a matter of fact, crunches also work the obliques. The external abdominal oblique muscle is certainly the most superficial and largest of the three flat muscles of your lateral anterior abdomen. When it comes to crunches, the major drawback is the fact that they are exclusive to the core. Although it is certainly beneficial to overall fitness, a strong core isn’t necessarily conducive to daily movements. In addition, even though they are good for developing, crunches don’t burn fat, same as sit-ups. Your current level of fitness is another consideration. While they can build up your abdominal muscles over time, crunches can also result in significant back pains, especially for beginners. Starting off with a set of 10-25 at a time, and adding other sets as you get stronger is the best approach if you happen to incorporate crunches into your daily workout routine. » Start by laying down flat on your back. » Stabilize your lower body by bending your legs at the knees and firmly placing your feet flat on the ground, shoulder-width apart. » With arms on the floor at your sides, lightly place your hands behind your ears or cross them on your chest. » To feel your abdominal muscles contracting, raise your upper body, head and shoulders only, from the floor towards your knees, exhaling as you lift. » Inhale as you slowly lower yourself down and return to your starting position. » To get a decent lower-leg workout, hook your feet together while performing crunches. » Unlike when you are exercising sit-ups, your lower back should stay on the floor when doing a crunch. Crunches ultimately top the list of abs exercises, which is why this simple, no-equipment technique is favored by professionals when it comes to strengthening the abdominals, hips, and obliques. However, because the basic crunch move might turn into a dull routine, we have rounded up some killer variations to help you improve your core game by tightening and toning your midsection further. Several crunch variations can activate the muscles in your arms, legs, and abs while increasing your heart rate, making them excellent as part of a dynamic warm-up. Some variations tone your obliques, keep your neck supported, and ease lower back discomfort. Others are ideal for active recovery mid-HIIT workouts as you transition from one set to another or when you need to slow your heart rate before switching from cardio to strength training. Sit-ups and crunches are both helpful when it comes to developing and strengthening core muscles, and over time, a stronger core might enhance your posture and even minimize the risk of future back injuries. However, none of the two exercises has the ability to burn fat. As such, you can only attain a flat, ripped stomach if you combine these two with a regular fat-burning aerobic workout and a healthy, low-calorie diet.